Mar 11 soybeans closed at USD14.12 1/4, down 2 cents; Nov 11 soybeans closed at USD13.48 1/4, up 6 1/2 cents; Mar 11 soybean meal closed at USD379.60, down USD5.70; Mar 11 soybean oil closed at 57.56, up 30 points. Weekly export sales were a combined old crop and new crop total of 915,400 MT, somewhat better than the 400 to 750 thousand MT anticipated. Rain relief is coming to Southern Brazil from the same weather system that drenched Argentina, say Martell Crop Projections. Mar 11 corn closed at USD6.57 1/4, up 3 1/4 cents; Dec 11 corn closed at USD5.87 1/4, up 11 1/4 cents. News just out today was that the EPA have said that they will extend permission to include E15 in vehicles made for the 2001 model year and later. Corn exports were above expectations at 904,800 MT for 2010/11 delivery and 125,000 MT for 2011/12, above combined estimates for sales of 500 and 900 thousand MT. Mar 11 CBOT wheat closed at USD8.24 1/2, up 21 cents; Mar 11 KCBT wheat closed at USD9.00, up 13 3/4 cents; Mar 11 MGEX Wheat closed at USD9.37 1/4, up 17 1/4 cents. Weekly export sales for the week ending January 13 were 1,054,300 MT for 2010/11 delivery and 93,500 MT for 2011/12 delivery, against expectations for combined sales of a rather wide 200 to 950 thousand MT. The USDA also announced private sales of 150,000 MT of wheat for delivery to Jordan today. 21/01/11 -- Jan London wheat went off the board today, closing unchanged at GBP194.50/tonne, with new crop Nov GBP2.00 higher at GBP172.00/tonne. Mar Paris wheat rose EUR0.75 to EUR259.50/tonne, whilst new crop Nov climbed EUR2.00 to EUR229.75/tonne. Nov London wheat posted a new all-time high close for the contract. Also I hear confidentially, but I can tell you as we're mates, that new crop is now trading at GBP160/tonne off the combine. 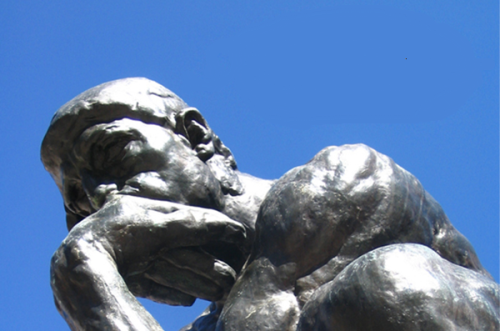 The market seems poised for another move higher on concerns over dwindling stocks. The IGC and Strategie Grains have both reported this week that 2010/11 ending stocks will be higher than earlier estimates, the question is will they really though? UK and EU exports are well ahead of schedule, indeed UK exports for the first five months of 2010/11 have already exceeded official Defra estimates for the entire marketing year. Today we had news that US weekly export sales were over 1 MMT - the highest at this time of year since 2005. North African and Middle Eastern buyers are queuing up to buy wheat despite prices being at their highest levels in at least 2 1/2 years, so where is the price rationing? One trader said to me today that it was astonishing that it was easier to trade at these levels than it was when prices were £30/tonne cheaper. On the weather front European weather is now trending cooler again after a warm period that coaxed wheat and rapeseed out of dormancy. 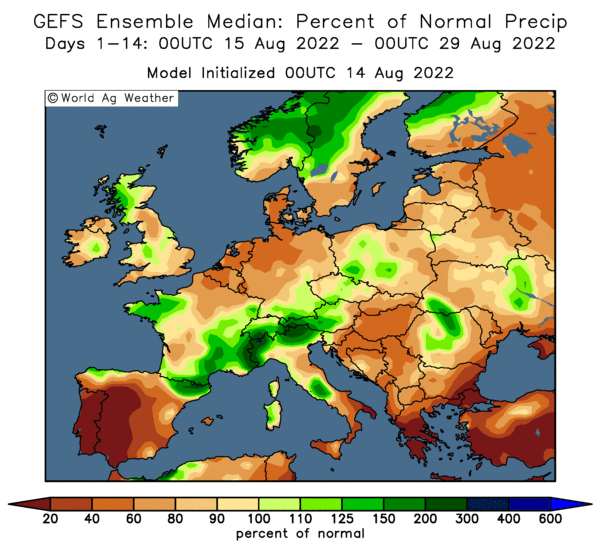 Weekend snow will develop in Eastern Germany/Poland, and a major Mediterranean storm will bring heavy precipitation into SE Europe, sat Martell Crop Projections. 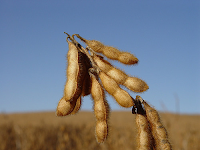 Mar 11 soybeans closed at USD14.14 1/4, up 2 3/4 cents; Nov 11 soybeans closed at USD13.41 3/4, up 5 3/4 cents; Mar 11 soybean meal closed at USD385.30, up USD2.00; Mar 11 soybean oil closed at 57.26, down 43 points. China agreed to buy 3 MMT of US soybeans today. What does that mean? Nothing much really. Estimates for tomorrows weekly export sales report range from 400 to 750 thousand MT. Mar 11 corn closed at USD6.54, up 12 3/4 cents; Dec 11 corn closed at USD5.76, up 7 3/4 cents. Estimates for tomorrow's USDA export sales report are between 500 and 900 thousand MT. Rumours yesterday that China had bought 500,000 MT of Australian feed wheat instead of US corn may have been exaggerated, only 150,000 MT of business was confirmed today. 20/01/11 -- If you are somewhat mystified and perturbed by my lack of blogging then blame this bearded hippy O level deficient bell end. Yes Sir Richy B has let me down yet again. His customer service department, not very strangely, appear not to be located in this country. Yet another example of a household name syphoning off British jobs and British services to somewhere where it seems that they hope that the lack of command of the Queens English will eventually lead you to simply go away and put up with it. "My name is #mutters something incomprehensible - possibly Bhuna McMumbai# We are velly solly Sir, we hope to have your service back up again by the 25th of January, is there anything else I can help you with?" 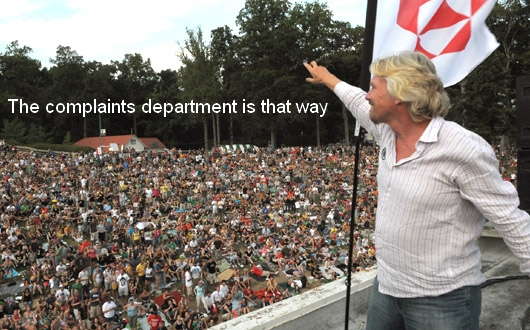 I HATE YOU RICHARD BRANSON. So much so that I will never eat your pickle or watch Deal or no Deal again. And the next time I need a hot air balloon to get somewhere fast you can go and whistle too. In the unlikely even that I require a virgin in the near future then you've lost that order as well. If there are any Sky reps reading this then I suggest that you get yourselves round to my neck of the woods pronto as there could be some willing takers round here. 20/01/11 -- EU wheat futures closed mostly lower Thursday with Jan London wheat up GBP0.40 to GBP194.50/tonne and Nov falling by GBP1.50 to GBP170.00/tonne. Paris wheat saw Mar fall EUR1.00 at EUR258.75/tonne and Nov EUR2.50 lower at EUR227.75/tonne. French analysts Strategie Grains reduced its forecast for the EU-27 soft wheat production for the coming harvest by 900,000 MT to 135.6 MT. However they also dropped their forecast for EU-27 soft wheat exports and cut domestic demand, that led to an increase in ending stocks. European price uncompetitiveness was to blame, they said. 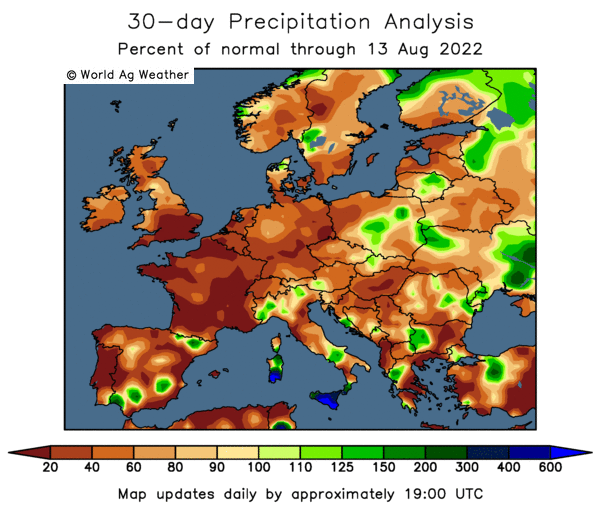 EU weather has turned a bit warmer, whilst beneficial precipitation was received yesterday in Russian Black Sea wheat areas, say Martell Crop Projections. The IGC, in its first forecast for wheat production in the coming season, pegged global production 23 MMT higher at 670 MMT. They also increased 2010 output by 3 MMT, with 2 MMT of that coming from Australia and the remainder from Argentina. Ending stocks for 2010/11 were upped 5 MMT to 185 MMT, only 6.5% below the so-called "burdensome" levels of last season. 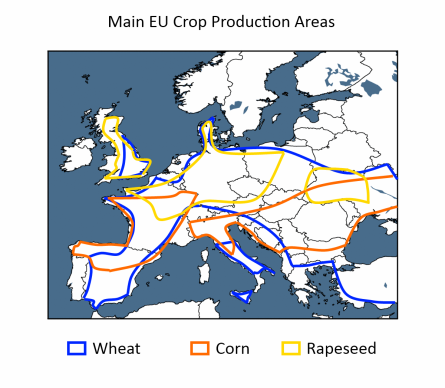 20/01/11 -- Using information gleaned from various sources here's Nogger's early take on wheat production prospects for Europe for 2011. The figures are based on an amalgum of estimates. Even for last season some official figures still vary quite widely. Overall all-wheat production is currently seen at 140.7 MMT, an increase of a relatively modest 3% on last year. CBOT March soybeans fell 1 3/4c at USD14.11 1/2; March soymeal closed down 10 cents at USD383.30; March soyoil ended up 14 points at 57.69. Beans were modestly lower for the second day in a row, with funds estimated to be net sellers of 2,000 soybean contracts on the day. Soybeans had been sharply higher overnight on spillover support from wheat and news that Oil World had dropped their Argy soybean forecast to 46 MMT, 16% down on last season. March corn fell 18 1/4c to USD6.41 1/4 a bushel. May corn fell 18c to USD6.51 1/4 a bushel. Talk that China will not be in the market any time soon for US corn, and indeed mat have bought significant volumes of Australian feed wheat instead, weighed on corn. Funds were reported to have sold somewhere in the neighbourhood of 20,000 contracts on the day, a significant volume. Argentina seems to be trending wetter. CBOT March wheat rose 4c to USD7.97 1/4 a bushel; KCBT March wheat gained 1c to USD8.77 1/2; and MGEX March wheat rose 5 1/4c to USD9.11 1/4. The market gave up most of its early gains following corn and soybean futures lower. Iraq joined the North Africa/Middle East throng clamouring for wheat today by tendering for "at least" 100,000 MT - they frequently buy more than they tender for. 19/01/11 -- EU wheat futures closed sharply higher with Jan London wheat up GBP3.50 to GBP194.10/tonne and Nov GBP2.40 higher at GBP171.50/tonne - a record high close for the contract. Paris wheat saw Mar climb EUR4.00 to EUR259.75/tonne and Nov rose EUR2.00 to EUR230.25/tonne. The market got spooked by ideas that Europe really could run out of wheat, and quiet whispers of defaults on existing sales. It's been known for a while that Defra's forecasts for UK wheat exports are full of "pie in the sky" and so it proved today when figures for exports for July/Nov came out, exceeding Defra's target for the entire 2010/11 marketing year. A hefty 472,000 MT of wheat was exported in November, bringing the MY to date total to 1.66 MMT, well above the 1.33 MMT that Defra had factored in for the whole of 2010/11 with fully seven months left to go. November was also the busiest month to date for UK exports, and 45% up on what was exported in October. The simple fact is that currently nobody knows what existing export commitments are in place for the remainder of the marketing year. Whilst sales may well slow down somewhat, recent estimates of shipments of 2 MMT already look conservative. Strong buying interest has emerged again from North Africa in the past few weeks, and production worries abound for US, Chinese and Russian wheat - three of the world's top four producing nations. 19/01/11 -- The overnight grains closed firmer, led by wheat which finished with gains of 10-14c and beans which were up around 16-17c. Corn was more of a follower ending 5-6c firmer. Wheat is up on heightened concerns over buying, indeed stockpiling, from North Africa and the Middle East. China only sold 3% of the wheat on offer in today's government auction, but right now that doesn't seem to matter. French wheat has set fresh contract highs as exports pick up again after a lull over Christmas and New Year. 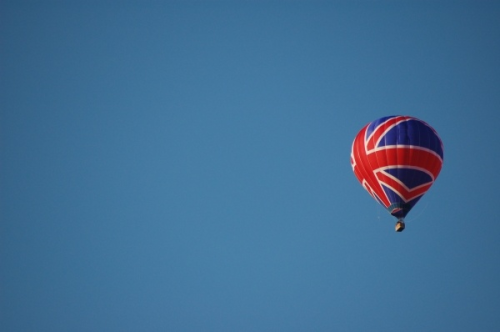 UK exports have already exceeded their target for the entire 2010/11 marketing year. Suddenly everybody wants to buy wheat, and they aren't too bothered what the price is as long as they get the order in the book. If it's like this now, what is it going to be like come spring when EU stocks start to get really tight? Meanwhile Chinese wheat is too dry, and so too is US wheat on the Plains and Russian wheat in the south. China's state-owned entity Sinograin sold almost 84 MMT of domestic grains and oilseed stocks in 2010, according to local media reports. They apparently only bought less than 35 MMT on the local market with which to replace those sales. Suffice to say that leaves a large gaping hole in their strategic reserves. The market believes that they will start to plug that hole soon. Oil World have dropped their Argy soybean forecast to 46 MMT, 16% down on last season. 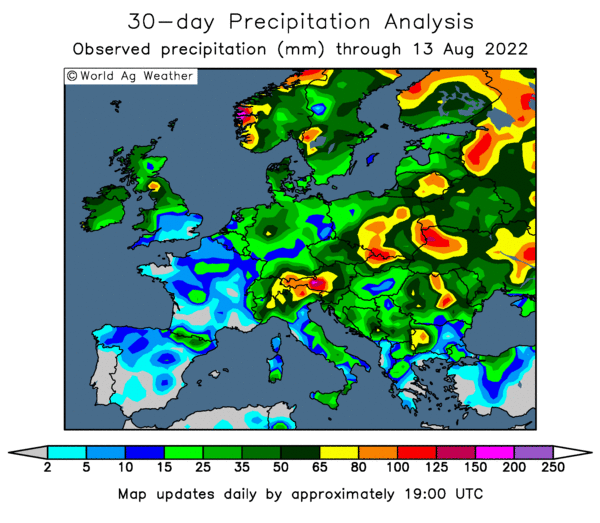 Rains have become more widespread in Argentina over the last 48 hours, but many believe that the damage may have already been done, particularly in the case of corn. 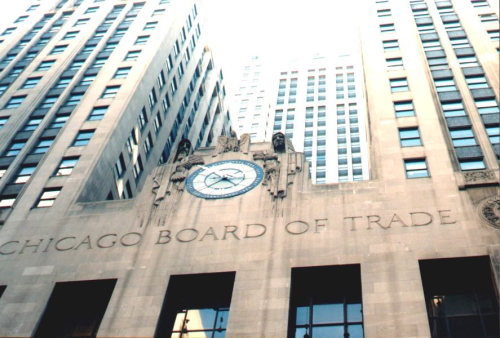 Early calls for this afternoon's CBOT session: corn up 5-7c, beans up 15-17c, wheat up 13-15c. 19/01/11 -- Latest guide prices for EU rapemeal. 19/01/11 -- The wheat market appears to have recovered from a little early 2011 wobble, and seems to have the bit firmly back between it's teeth again this morning in an attempt to press on into higher territory. Whilst old crop flirts with trying to pop above GBP200 again, plenty of people also now seem to be buying into the longevity of these prices too. New crop Nov11 London wheat is currently trading at GBP171.50, within GBP1.50 of the all-time high for the contract set on the opening trading day of 2011. A close at that tonight would be a record close for the contract. Even Nov12 is starting to attract peoples' interest now, currently GBP1.50 higher at GBP146.50, a seemingly attractive GBP25 discount to Nov11. Unease about the unrest in North Africa seems to be rippling around the market, with the likes of Turkey, Libya, Morocco and Jordan all coming in to buy wheat just as Algeria decides to refill it's boots. FranceAgriMer currently project French wheat ending stocks at a tight 1.96 MMT, what they haven't perhaps told us is that those stocks are going to be in North Africa not France! 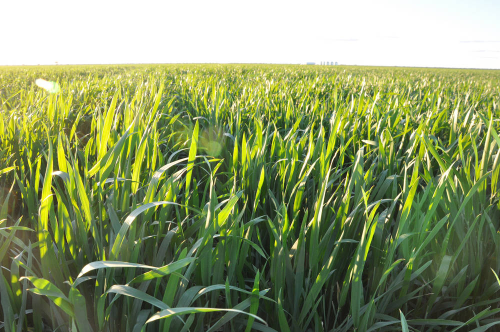 Looking around the globe, possibly the next catalyst that could send the market surging into new uncharted waters might come once winter wheat starts to emerge from dormancy in the spring. We know that US wheat went into dormancy in a pretty poor state. The question now is how is it going to come out of it? In the case of Kansas, which accounts for almost a quarter of the entire US crop, probably not very well at all is the most likely answer. In the last USDA weekly crop condition report ahead of the winter, based on conditions as at Nov 28 2010, Kansas wheat was rated 25% poor/very poor, and only 37% good/excellent. By the end of the year those ratings are said to have declined to 33% poor/very poor and only 27% good/excellent. This autumn/winter has been "one of the driest planting seasons on record in the top US wheat state, and a bad omen for new crop production," say Martell Crop Projections. 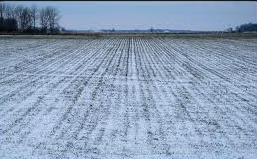 Large areas of planted US winter wheat regularly don't make it through to harvest as failed fields are grazed or ripped up and replanted with other crops in the spring. It would seem that we have the potential for even more of this practice to occur this year, especially with alternative crop prices offering such lucrative returns at the moment. 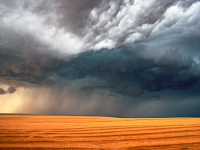 The markets perception of the implications of a significant Kansas wheat crop failure are more important than what the real implications might be. CBOT March soybeans settled 9 1/4 cents lower at USD14.13 1/4; Nov soybeans ended 2 3/4 cents higher at USD13.26; March soymeal closed USD4.70 lower at USD383.40; March soyoil ended 28 points higher at 57.55. Beans were under pressure on news of China cancelling a couple of cargoes of US beans due to negative margins. Improved rains in many parts of Argentina added to the negative tone. AgRural upped their Brazilian soybean estimate to a record 69.7 MMT yesterday. March corn finished up 10 3/4c at USD6.59 1/2; May corn finished up 11 1/4c at USD6.60 1/4. Corn hit a fresh 30 month high on spillover support from wheat. Argentina got some rain over the weekend, but the corn crop is far from out of the woods yet. The USDA's projections last week for the second tightest global stocks/use ratio in the last 35 years, equivalent to around 55 days of supply is keeping the market nervous. China may be about to attempt to rebuild it's state stockpiles after heavy government selling in recent months in an attempt to hold down prices. CBOT March wheat closed up 20c at USD7.93 1/4; KCBT March wheat rose 16 1/2c to USD8.76 1/2; MGEX March wheat gained 15 3/4c to USD9.06. Panic in North Africa was largely behind wheat's gains today. Algeria has bought almost a million tonnes in the past month as it tries to stave off political overthrow, a fate that neighbouring Tunisia has already succumbed to. Turkey bought 145,000 MT of US wheat today. Libya and Jordan have also bought in recent days or are at least in the market. 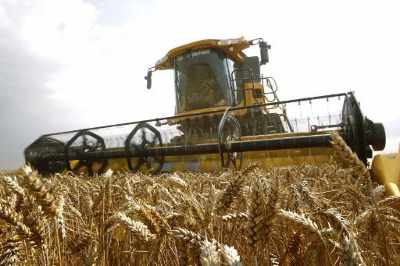 18/01/11 -- Jan London wheat closed GBP1.00 higher at GBP190.60/tonne, with new crop Nov GBP2.60 higher at GBP169.10/tonne. Mar Paris wheat rose EUR4.00 to EUR255.75/tonne, whilst new crop Nov climbed EUR3.75 to EUR228.25/tonne. The quality wheat traded in Paris continues to rebuild it's premium over that traded in London. Ukraine has hinted that it may at least review it's existing export quota system - currently in place until the end of March - sometime next month. That doesn't help too much if you want wheat tomorrow mind. If you do you can cross Argentina off your list as they are on strike. In addition Australia has logistical and quality problems of it's own. That leaves either France or the US if it's quality bread-making wheat you're after, hardly what you would call a buyers market. The Algerian government seem to have their buying boots on right now, keen to avoid the same fate as the recently toppled Tunisian ruler Zine al-Abidine Ben Ali. They are not alone amongst North African and Middle east nations fighting civil unrest over soaring food prices. China's wheat production potential this year is still very uncertain following drought in the north. Meanwhile winter wheat in the top producing US state is also under threat from drought. 18/01/11 -- The overnight trade closed with wheat around 15c higher, corn up 4-6c and beans 3-6c lower. 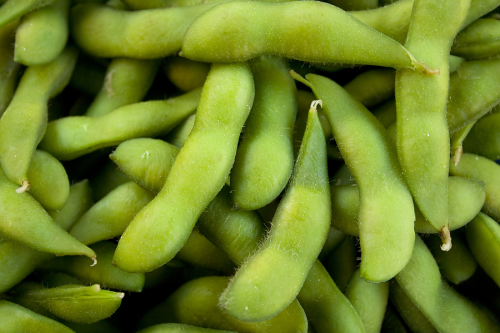 China may have cancelled a couple of soybean cargoes over the weekend due to negative crush margins, is one report doing the rounds which may explain beans performance this morning. Even so, they will import 4.55 MMT of the buggers this month, up from a previous estimate of 3.35 MMT, according to their commerce ministry. They only attracted buying interest for 174 TMT of corn in today's government auction apparently, less than 10% of what was on offer, and continuing with the recent trend. Japan are shopping for their regular weekly wheat tender, looking for 149 TMT of US/Canadian wheat. North Africa and Middle Eastern buyers are also in the market, with Algeria reported to have bought some 600,000 MT late last week, and rumoured to be still looking for more. They say that they are going to increase the amount of wheat that they sell at subsidised rates to local millers to help against food price inflation. The market seems to think that the government there are caught between a rock and a hard place and may attempt to buy their way out of trouble. Booking large quantities of wheat, even at these levels, may be one way of doing it. Of course they aren't the only African nation seeing such public reaction to the current situation, and others may also be forced into entering the market soon high prices or not. Argentina got some rain over the weekend, but the soybean and corn crops there are far from out of the woods yet. Brazil is faring somewhat better, apart from the extreme south. AgRural upped their Brazilian soybean estimate to a record 69.7 MMT yesterday. Argy farmers are on strike this week, disrupting grain supplies to the ports. It may only be a matter of time before dock workers decide to throw their tools down too if recent years are anything to go by. Drought remains a problem for wheat in the top US producing state of Kansas. The accumulated moisture from October 1 to January 15 was only 2.51 inches - just 56% of normal - according to Martell Crop Projections. The dollar is at or close to two month lows against both sterling and the euro. Concerns are mounting over the size of US government debt which has risen from USD7.6 trillion to USD14 trillion in the last five years. Are we in for a period of prolonged dollar weakness? If so dollar-denominated commodities could go higher yet. 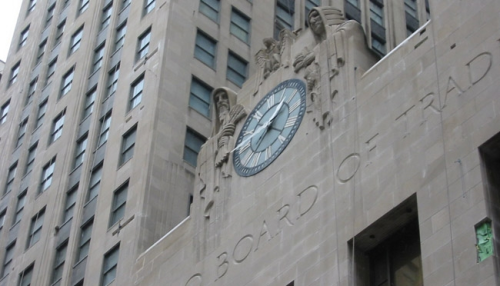 Early calls for this afternoon's CBOT session: Wheat up 13-15 cents, corn up 5-7, soybeans down 2-4. 18/01/11 -- Latest guide prices for EU rapemeal. 18/01/11 -- Figures just out reveal that UK inflation rose by much more than most expected last month, coming in at 3.7% - from 3.3% in November and getting on for double the Bank of England's target rate of 2%. We probably WILL be double it once January's figures come out next month. The car went in for a service & MOT yesterday, even though it wasn't due until the end of the month. The garage rang me twice in December to remind me to book it in. When it usually goes in, I'm struggling to find a parking space and have to simply stick it wherever I can, but not yesterday - there was acres of room. It's normally in all day too, but not yesterday, despite needing a few tweaks here and there. I took the dog with me and walked him back and they were on the blower almost as soon as I'd walked in the door. The guy in the courtesy car they sent to collect me said he'd never known things so quiet, people just haven't got the spare cash he opined. As we drove on we went past the local petrol station selling diesel at 131.9p/litre - the one generally accepted as being the cheapest in the area. That's only 1p cheaper than the most I recall it ever being at the height of the USD147/barrel oil price boom in 2008. I decided to go for a quick pint in the afternoon - there was after all no Chicago to distract me. So I popped into Knaresborough for a beer with my old chum Mr H. Lucky old Mr H took early retirement and can usually be found in one of two hostelries in the town around 2pm. I haven't been over to see him for about a fortnight, with all the snow & everything. 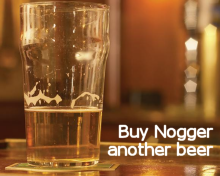 Bugger me, a pint of Becks Vier has gone up 20p since then. Interest rates may be going up sooner rather than later is what the market is starting to think, as the price of everything moves up all around us on an almost daily basis it now seems. The pound is up above 1.60 against the dollar for the first time in almost two months this morning on the back of this latest news. It only stayed there briefly then, the last time were were above that level for any length of time was in late 2009. Is this an opportunity or a change of fortunes? 17/01/11 -- EU wheat futures closed mixed Monday, with nothing in the way of fresh impetus from a closed US market. London wheat finished sharply lower with Jan down GBP3.75 to GBP189.60/tonne and Nov falling by GBP1.00 to GBP166.50/tonne. Paris wheat saw Mar up EUR1.25 at EUR257.75/tonne and Nov EUR1.75 higher at EUR227.75/tonne. It's been twenty sessions since front month London wheat closed below GBP190.00/tonne, falling today on a firmer pound and concerns over demand for feed wheat from an ailing livestock sector. Paris milling wheat rose on reports that Algeria was again back in the market buying wheat over the weekend, despite soaring prices, in an effort to quell continued unrest over soaring food prices in the North African nation. A weak euro also helped Paris wheat push firmer. Countries like Algeria and Tunisia seem to be willing to buy almost any wheat they can get their hands on at the moment, with reports today suggesting that the former bought more than half a million tonnes on Friday. Whilst Argentina and Australia are expected to flex their export muscles over the coming months, the formers growers have just begun a one week strike, whilst flooding and quality concerns in the latter may also impact upon their shipments to foreign destinations. Meanwhile if you are a desperate North African buyer faced with civil unrest and a military coup, then buying wheat on your relative doorstep from a reliable supplier like France looks an attractive proposition. 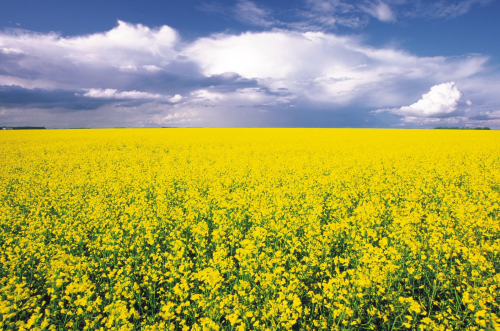 17/01/11 -- The Ukraine Ministry report significantly better crop conditions than twelve months ago, particularly for rapeseed. As of the end of last week winter rapeseed was rated 54% in good condition (compared to only 39% a year ago), with a further 38% rated satisfactory (from 40%) and only 8% weak/thinned (from 21%). Despite a fall in planted area, Ukraine's rapeseed crop could rebound close to 2 MMT this year if weather conditions play ball, according to UkrAgroConsult. 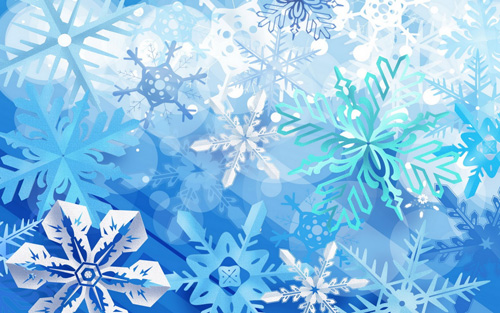 A very hard 2009/10 winter saw high levels of abandonment last season, whereas so far in 2010/11 weather conditions have been relatively benign. Other crops are also showing significant improvement on last year. Winter wheat is rated 57% good (from 46% last season), 36% satisfactory (44%) and 6% weak/thinned (10%). Winter barley is rated 47% good (42%), 45% satisfactory (47%) and 9% weak/thinned (12%). Note: any slight discrepancies are due to rounding. 17/01/11 -- The German dioxin in feed contamination saga is turning into a "scandal within a scandal" said Agriculture minister Ilse Aigner after almost a thousand more farms were closed over the weekend, according to this report from the BBC. The short-term effects of this are not good. German pork, eggs and chicken consumption has plummeted following the outbreak of the news, and slaughterings are likely to increase further after this latest development. "German pig producers have seen their prices fall by more than £28 a pig. The dioxin scare has also had a knock-on effect on British cull sow prices, which have fallen 10p a kilo in the last few days," according to Pig World. 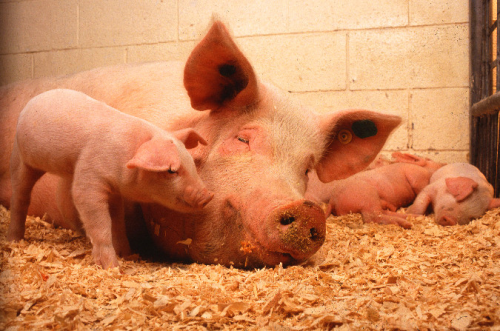 The dioxin scare is the latest kick in the nuts for many pig producers who, faced with soaring feed prices simply don't have the time to sit and wait for pig prices to recover. Meanwhile this may be the last straw for pig producers on the continent, who are exiting the industry "left, right and centre" according to my pig nutritionist mate Phil Baynes, faced with the impending added expense sow stall ban on Jan 1st 2013. That may be good news for British producers in it for the long-haul, but there looks like being a bit more pain to endure first. Meanwhile, the implications for feed demand within the EU are there for all to see. The National Pig Association forecast EU pigment production to decline by almost 900,000 MT this year, and more more than a million tonnes each in 2012 and 2013.